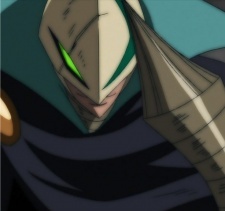 Along with Vulcan, Mars once held the title of the Empire's strongest before Casshern, Dio, and Leda were born. Wanting to keep that title even in ruin, Mars and Vulcan plot to kill Dio by spreading a rumor that they know Luna's whereabouts; this succeeds in attracting Dio and Leda's attention. Mars and Vulcan battle as a tag-team, with Mars using his agility and multiple extending arms to dominate the fight. In their first battle with Dio, Mars and Vulcan win but Mars spares Dio's life at Leda's request. But after Leda leads him and Vulcan to Dio's castle, Dio is waiting there and destroys Mars.